So in what way have I taken over the Cranks website, you may well ask? Don’t worry, I didn’t muscle my way in and hold a piping bag to their heads. I’ve done nothing more dastardly than write three autumnal slow food posts for this lovely month of October. You can read about my early association with Cranks in the first post along with my not-to-be-missed recipe for roasted squash, pepper and leek tart with a walnut crust. My second post is all about slow food and comes with 12 autumnal slow food ideas – it’s well worth a look. The third post hasn’t been published yet, so I’ll have to keep you in suspense on that one. is particularly close to my heart. I’ve been cooking with it for many years now and it has some fabulous recipes. The author, Nadine Abansur is an accomplished vegetarian cook who worked with Cranks for many years. However, this paperback edition includes one of my very own recipes and I am totally thrilled. For a detailed review, have a look at my Cranks Bible post from earlier this year. NB 2 November 2106 – I can now reveal my final recipe which has just been publish on the Cranks site. It’s this comforting barley bean bowl with hazelnuts, mushrooms, black beans and cabbage. Perfect for autumn. 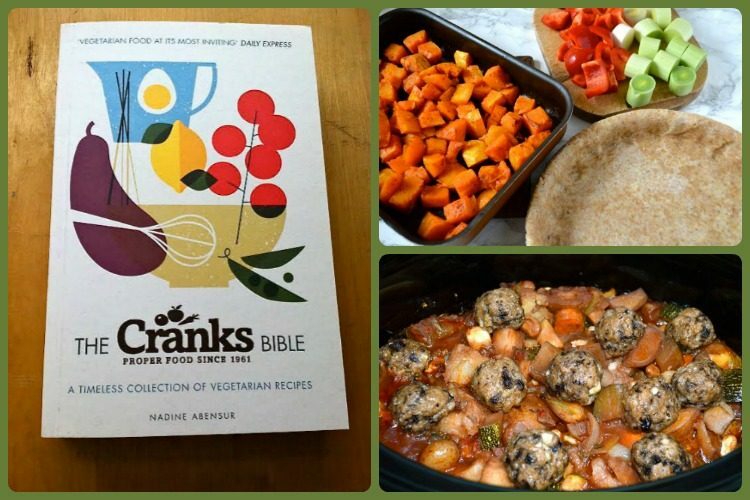 All About Food is kindly offering five Tin and Thyme readers a copy of the Cranks Bible. To be in with a chance of winning, please fill in the Gleam widget below. You will need to leave a comment on this post, answering the question, which then gives you additional chances to enter if you so wish. Gleam will pick a winner at random from the entries received who will then be contacted via e-mail. If you are commenting anonymously, please give me some way of identifying you as I will be verifying the validity of entries. Any automated entries will be disqualified. This giveaway is only open to those with a UK postal address. Winners will need to respond within 5 days of being contacted. Failure to do this may result in another winner being picked. There are no cash alternatives. The Cranks Bibles are offered and provided by All About Food and Tin and Thyme accepts no responsibility for the acts or defaults of said third party. Tin and Thyme reserves the right to cancel or amend the giveaway and these terms and conditions without notice. Disclaimer: sponsored post. I was not required to write a positive review and all opinions are, as always, my own. The post contains affiliate links. Buying through a link will not cost you any more, but I will get a small commission. This helps keep Tin and Thyme blithe and blogging. You can find other competitions at The Prize Finder and Loquax. Curry week and chocolate week? A good month indeed! Yes indeed. Both of them were actually in the same week – bliss! I like your thoughts on slow food. Not quite thought about that aspect before. Apologies for the confusion and thanks for coming back to comment. Slow food is an alternative to fast food and is all about creating recipes using traditional wholesome ingredients such as meat, vegetables, pulses etc either homegrown, or from small businesses. Yes, that’s pretty much my understanding of it too Tracy. Thanks for coming back to comment. Slow food in the form of slow cooking (which I think you are referring to) means comforting winter casseroles from cheaper cuts of meat, which are made succulent through long cooking at low temperatures. It’s interesting to hear what everyone’s take on slow food is. For me, it’s not so much slow cooking, although that’s part of it, it’s about good food cooked from scratch. Slow Food?? cooked from scratch with natural ingredients and love! Slow food makes me think rustic and made with fresh ingredients like when I cook from scratch using my allotment goodies and herbs from the garden. My whole life is slow, so preparing slow food is a natural part of it. Meals are nearly always from scratch. Even after all these years I can still look forward to the simple act of slicing fresh vegetables and washing salads. Just one thing after the other. No rushing. Classical music in the background. Taking deep breaths once in a while. Looking out of the kitchen window into the garden. Lovely smells, delicous food ….. It all sounds so wonderful Henk. One day I will get a bit more time in my life. A slow life sounds totally dreamy. Dom, there are always amazing aromas wafting through your home and loads of tasty tasty food. Slow cooking to me means something that takes some time to prepare, so usually cooking from scratch, i.e. peeling and preparing veg, soaking and cooking beans, lentils, etc, and either cooked in the oven like a casserole or crumble, in a saucepan like a stew or curry or slowcooker. I think of slow food as being meals that are cooked from scratch and generally healthy as well. Slow cooked food means comfort, and warmth and all things lovely to me. And maximum return for minimal effort! I know I don’t qualify to enter for the Cranks book, but I was sad to see that Cranks of Carnaby Street was no longer around. I used to work a few steps from this shop and many times enjoyed a lovely lunch there. I’m sure the surviving Cranks still serves beautiful healthy food. Slow cooking – the way I always cook!!! i think slow food means, food that is cooked slowly to make meats more tender and allow the flavour to really soak into the meat. It means food which tastes good and sustains our communites, food which doesn’t damage the environment in its production or that is full of preservatives, and that both the farmer and shopper get a fair deal in price. It means a more abundant way of eating – we have 4000 varieties of apple in the UK, yet 70% of all those we eat are from 3 varieties, and 70% of those apples are imported. It doesn’t have anything to do with cooking speed – a beautiful autumnal mushroom omelette would be Slow Fast Food! Great explanation Shane. I was hoping someone would mention the Slow Food movement. Lots of people have fond memories of Cranks, it’s good to hear them Sara. Slow food is what I love best, whether it’s in my slow cooker, casseroles in the oven or nice slowly baked fruit cakes. And of course it is also about food being grown, reared slowly in its own time, not forced. I agree, how the food is produced is a key factor. You’ve got me all fired up to make a fruit cake now. Slow cooking meat helps retain all the good nutrients. I’ve actually never heard the expression “slow food” before, but to me it means recipes you can just throw a load of ingredients in together and then leave to potter on whilst you do other things! Slow food is food that is slow to prepare. Back to basics, cooking home grown ingredients, giving a wholesome meal. Slow food to me means nourishing food. Something to come home too, and something that fills you up! That tart looks amazing! Slow food to me is made from scratch and that effort means you must savour every bite -slowly! Thanks Rebecca, the tart is a firm favourite with us. Slow cook means to me releasing wholesome, nutritious flavours into the food and at the same time achieving a work/life balance! To me it’s all about traditional food – food that’s cooked with local traditions in mind, and using ingredients that are local and grown with care. All good things take time and care, and that applies to making great food too. Taking time to cook food slowly and thoroughly combine different flacours. Slow food means that the food is prepared according to local traditions, normally using local ingredients. Slow food means to me shopping local cutting down on carbon footprint and seasonally. Tasty home cooked food that someone has taken the time to prepare for the whole family to enjoy. For me, slow food is all about thoughtfulness in our food, taking time to consider where is comes from and seasonality, how it’s prepared in traditional ways, and time to savor and enjoy. For me slow food is about quality of food, seasonality, sourcing locally and then taking the time to prepare and cook it well. Slow food to me means taking time and careful preperation to make meals cooked with love. This includes sourcing ingredients locally. It’s good for the environment and it’s good for you. Slow food for me is a recycling bin devoid of excess packaging, ready meal trays and bits of plastic, hazard tape across the microwave door and really enjoying sourcing great ingredients, trying new recipes and loving my time spent in the kitchen. For me ‘Slow Food’ is food cooked with care and attention to detail, not simply thrown together but using ingredients that takes thought and intuition when it comes to what tastes fit together. I think it has something to do with regional food traditions. It is a global, grassroots movement that links the pleasure of food with a commitment to community and the environment. It works to build links between producers and consumers. Slow food is about cooking food from scratch using quality ingredients. Another side to it is eating the food in a relaxed and leisurely manner with good company i.e. not eating on the move. Slow food is somethings I take time over and think about the ingredients and where they came from. Slow food means more traditional kind of food to me – stews, soups etc. Things that take a while longer to cook but are much more nutrional, filling, and warming. Oops, ,it’s my comment in the name box by mistake! Ah well, here I go again… To me slow food is all about slowing things down. Taking the time to cook properly (doing the opposite of fast food) and then the time to savour it with loved ones. To me, slow food means cooking from scratch with ingredients sourced as locally and seasonally as possible. Slow food means to me the freedom to spend my day enjoying the great outdoors then coming home to the welcome aromas of a delicious hearty meal! slow food as being meals that are cooked from scratch and with lots of vegetables. slow food means early preparation, then a long delicious anticipation with no disappointment at the end of it! Food that takes time & care to prepare, with nothing pre-made. It means warming, tasty and healthy. And the lovely smell of ‘proper’ grub wafting through the house. Slow food is about taking your time to wait for food that is made from fresh ingredients and cooked just for you. *aagh* I think you may have said ten words or less but can’t get back in to check the question so may have dreamed it, if not the shortened version! Slow food to me means lovingly prepared from scratch – the opposite of fast food. In our household we tend to make things ourselves rather than buy convenience food. We don’t do takeaways, we don’t even own a microwave. It takes time to prepare meals but at least we know what goes in them and what doesn’t. That sounds very similar to us Mrs F – long may it continue. Slow food is any food that takes longer than 15 minutes from declaration of intent to the moment you start eating. Faster than that and odds are it’s probably not very healthy haha! Food that takes a while to grow and a while to cook, because that’s just how it is. Slow food means home-cooked foods, made with wholesome ingredients! To me, slow food is food which takes more then a couple of hours to complete – stews, belly pork etc. To me – Slow cooking is gently cooking through at a low temperature to retain and enhance the flavouring of meat. Slow food is what used to be everyday food, made at home from real ingredients not mass-produced fast food full of addictive saturated fats and additives. slow food means a meal cooked easily. Slow food. I’ve never heard this term before. Does it mean food that releases energy slowly, throughout the day – like porridge? It means you can savior all the taste, slow is the future! For me it definitely means warming and comforting food, best enjoyed when the weather starts to become colder. I love this book – I’ve got a copy of a previous edition, but I admit that many of the pages are stuck together with food splashes! Always a sign of a good cookbook that has been used over and over, but I’d love a shiny new copy and promise to look after it! I think slow cooking is taking the time to gather all your ingredients together from great sources be they your allotment, farmers markets or independent shops. Then preparing them with love and sharing your food with friends and family. Forget to say well done on the recipe inclusion! Looks delicious. Thank you Ness, lovely to hear from you. I keep forgetting about Love Cake until it’s too late. Will try to enter this month. BTW #WeShouldCocoa has no specific theme anymore, just any recipe that includes chocolate as a main ingredient. Fresh ingredients cooked from scratch over a long period of time to develop the flavours. Food that has a lot of thought and effort put into keeping the max nutritional content. To me slow food means the veggie stews that I put in my slow cooker before I go to work then a lovely meal is ready when I walk through the door. It’s a meal that has slow releasing energy that will maintain you throughout the day. Healthy and slow, long releasing energy? Slow food means weekend cooking. Taking the time to source the best recipes, best ingredients I can afford and spending a whole day preparing a delicious feast. It’s convenient but also means the food gets cooked properly and you have more control over flavourings etc. I haven’t heard the term ‘slow food’ but imagine it refers to meals cooked in a slow cooker. Meals cooked from scratch using fresh ingredients and then cooked slowly to get the full flavours. Food that is more flavourful, which is prepared from scratch. Slow food to me just means cooking from scratch with all natural ingredients. I’ve never heard the term slow food but I hope that porridge is included! I think porridge is definitely included 🙂 Slow food is a concept of taking care about the food we eat, how it is produced and where it comes from as well as cooking from scratch – or that’s how I understand it anyway! Slow food , the use of good natural wholesome home grown preferred organic in recipes . I love to cook from scratch for the family, usually with one for the freezer for those times when there isn’t time to be slow! To me slow food is food prepared from scratch, respecting the time and care involved in producing or raising those ingredients and then appreciating their qualities as you eat. My husband’s had to go veggie because he’s got gout! This book looks great and would be really helpful. I haven’t heard of Slow foods, but I do love to slowly enjoy food. A curry full of flavours to make sure they are given enough time to infuse together to make one delicious meal! slow food is not an expression I am familiar with..but I guess if takeaways are fast food then food prepared at home is slow food…………….maybe?? Sort of David. Slow food is a concept of taking care about the food we eat, how it is produced and where it comes from as well as cooking from scratch – or that’s how I understand it anyway! Slow food to me means cooking from scratch and making a good dish with a longish cooking time. I guess slow food for me could have two meanings – your traditional ‘slow cooked’ stews and hearty winter broths, or dishes that are properly home made with everything prepared from scratch. Slow food – not fast food. Good quality, healthier, prepared from scratch meals. Slow food is healthy and nutritious to me. It can even take a while to cook. I’ve had the pleasure of tasting some of these recipes – yum!!! Would love a bible of my own! My younger sister is a vegetarian so I am always on the lookout for new and exciting meals to make her! Slow Food to me is the whole ethos of taking your time to savour and enjoy your food and meals – not eating on the run, wolfing down your meals as part of your busy life but taking the time out to sit, relax and savour every single mouthful. Slow food to me is the opposite to fast food. Food that is cooked from scratch from quality local ingredients and with love, care and attention. Slow means to me, hearty food that you’d eat in the winter. slow cooked food means fresh nutritious and slowly prepared so all the flavours get absorbed and makes it extra tasty. Im Omniverous…but love Veggie food ! COOK WITH ALL DIFFERENT ROOT VEGETABLES MAKES A VERY HEALTHY DINNER. Slow food is homemade, healthy food. Something cooked well and using good ingredients. To me slow cooking is doing it the right way, all from scratch. Its wholesome & hearty, good for body and soul. I feel I’m providing for my family more when I cook proper meals rather than a fast, easy, open box and stick it into the oven meal! Yay Helen, that’s about the most comprehensive response yet and the one that I understand slow food to be. Longer cooking time meaning lots of really deep and intense flavours, something to be done on a cold and wet weekend. Yay, another good answer Colin – a succinct one too. I’d say it was something you spent time making from scratch, with love, therefore it’s tasty & nourishing. Slow cooked food means comfort, warmth and all things lovely to me.